Talk to anyone who has visited Peru and chances are pretty good that Machu Picchu will be the first topic to arise. But there is much more to Peru than this ancient Inca citadel. Miles of unspoiled beaches, hundreds of other archeological sites, colorful colonial cities, and dense tropical jungles provide unforgettable experiences to those who visit the rest of the country. For those that have not yet traveled to this part of South America, the following will provide a good introduction to Peru. Perlocated on the western side of South America, with a 2,000-mile coastline stretching from Ecuador in the north to Chile in the south. Its eastern border is shared with Columbia, Brazil, and Bolivia. Peru’s population of 32 million people places it between that of Australia and Canada. Over 75% of the population lives in urban areas with the remainder scattered throughout vast regions of sparsely populated jungle, desert, and mountains. The median age is only 28 years, more than a decade younger than the U.S. or Canada. It is a very young population. About one-third of the population is concentrated in Lima, the capital, and a few other large cities. Lima’s population of more than 10 million makes it the second-largest city in the Americas, behind São Paulo. It is followed by the northern city of Trujillo and the southern metropolis of Arequipa, each with populations approaching 1 million people. Mostly as a result of the hilltop citadel of Machu Picchu and other Inca ruins, Peru remains a popular tourist destination. An increasing number of visitors are also attracted by Peru’s increasing culinary fame as well as its high-quality alpaca textiles. In terms of international tourist arrivals, Peru is one of the most popular countries in South America. The annual number of visitors is now approaching 4 million. For international tourists, Jorge Chávez Airport (LIM) in Lima is the main point of entry. It’s also the main hub for most local domestic flights connections. All the major cities have international airports but flights to and from North America and Europe almost always pass through Lima. Although direct flights are available, it is more common and cheaper to have at least one stop, usually somewhere in Central America. In Peru, buses are the most popular form of long-distance travel. Many buses offer overnight trips and include seats that fully recline, meal service, WiFi, and “in-flight” entertainment. Drivers change every four or five hours and speeds are automatically limited. A good quality bus trip in Peru is similar to a business class flight. Some of the better companies include Cruz del Sur, Ittsabus, and Oltursa. For short trips, collectivos provide inexpensive transportation within cities and around the countryside. These popular vehicles range in size from vans to small buses and rarely cost more than a few dollars. With the spectacular Andes Mountains splitting the country into the Amazon on one side and some of the driest desert in the world on the other, it is not surprising that Peru is one of the world’s most biodiverse countries. It is home to 28 of the planet’s 32 climates and 84 of the 103 existing ecosystems. Two-thirds of Peru is covered by Amazon rainforest but the Pacific Coast is a surfer’s paradise. It is also home to the highest sand dune in the world, the 3,860-foot Cerro Blanco located in the Sechura Desert near the Nazca Lines. There are countless opportunities for surfing (sand and water), hiking, camping, mountain climbing, and other outdoor adventures. Did you know that Peru is also home to the world’s deepest canyons? Cotahuasi Canyon in the Arequipa region is 11,597 feet deep—twice as deep as the Grand Canyon. Nearby Colca Canyon is slightly smaller. And Lake Titicaca, also in Southern Peru, is the world’s highest navigable lake, and South America’s largest lake. • Other than in the far north, the coastal desert regions rarely receive rainfall and represent some of the driest terrain on earth. • Lima and the southern coast tend to be foggy and cool from June through October with sunshine and warmth appearing again from December through April. Winter temperatures tend to be in the 60s while summer days can reach the 80s. • Coastal areas north of Lima tend to become warmer and sunnier the further north you go until you reach year-round summer weather in the northern coastal regions of Piura and Tumbes. • The interior mountainous regions are the opposite; cool and rainy in the summer with little rainfall during the winter months. • The jungle varies from a humid semi-tropical climate in the high altitude areas to a very humid tropical climate in the low altitude area. Peru is a democratic republic with a multi-party system. The President is both head of state and government. The President designates the Prime Minister and, on his or her advice, the rest of the Council of Ministers. 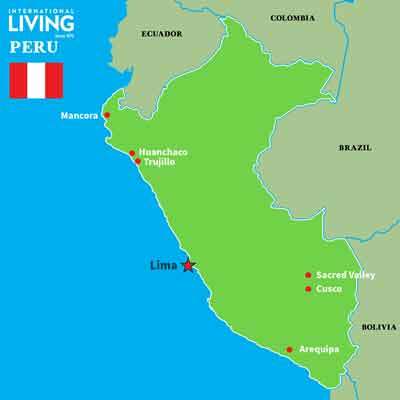 Peru is divided into 25 regions and the province of Lima. The regions are subdivided into provinces (provincias), which are composed of districts (distritos). There are 196 provinces and 1,869 districts in Peru. According to the Peruvian Constitution of 1993, Peru’s official languages are Spanish and Quechua, Aymara and other indigenous languages in areas where they predominate. Spanish is spoken by 84.1% of the population and Quechua by 13%, Aymara by 1.7% while other languages make up the remaining 1.2%. Although you will find some English spoken in tourist areas, it is still uncommon in the rest of the country. Some basic Spanish is very useful for traveling or living in Peru. Lima: Lima is often overlooked as visitors quickly travel on to more popular regions of the country such as Cusco and the Sacred Valley of the Incas. However, it is worth staying at least a few days to enjoy the museums, art galleries, and world-renowned restaurants. The city is also home to the vast majority of expats in the country. 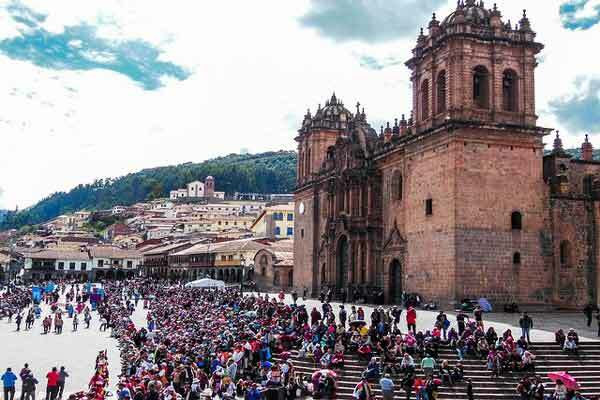 Cusco: This UNESCO World Heritage Site and high-altitude city is the original capital of the Inca Empire. A mixture of new and old, Cusco makes a great base for exploring the surrounding area. The picturesque Barrio de San Blas (San Blas neighborhood) with its steep and narrow streets, art galleries, and old Spanish houses built on Inca foundations is well worth a visit. 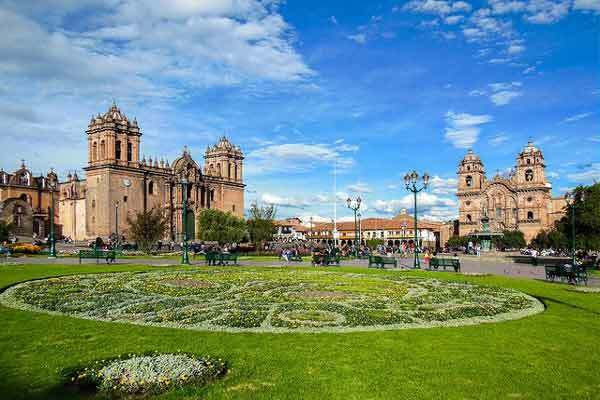 Other popular sites include the 16th-century Santa Domingo Cathedral, the Precolumbian Arts Museum, and the nearby walled complex of Sacsayhuamán that dates back to about 1100. The Sacred Valley of the Incas: Only 12 miles north of Cusco at its closest point, the Sacred Valley follows the Urubamba River for over sixty miles from the hilltop citadel of Machu Picchu to the small town of Pisac. This narrow valley of rich farmland is bordered by towering mountains and dotted with ancient Inca terraces rising up the hillsides that overlook the valley. Numerous Inca ruins can be found throughout the valley and offer wonderful opportunities for hiking and exploring, especially in and around the small towns of Urubamba and Pisac. Pisac is also well-known for its bustling local market where artisans from around the valley regularly display their fine textiles and other crafts. 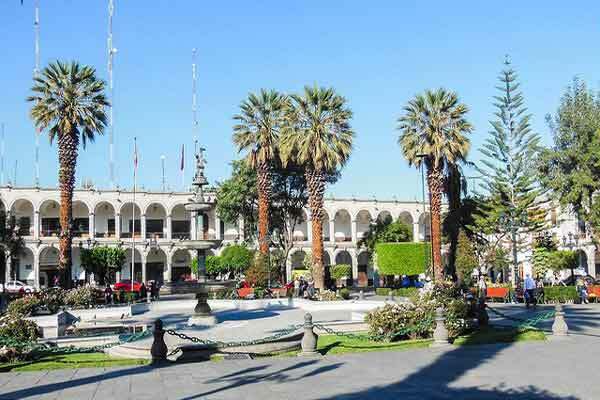 Arequipa: It’s difficult not to be impressed as you stand in the center of Arequipa’s Plaza de Armas. Three towering volcanoes dominate the city skyline and the huge Basilica Cathedral takes up one entire side of the square. The white volcanic stone buildings of the Spanish colonial historic center reflect the bright sunlight. With its low rainfall (less than four inches per year), copious amounts of sunshine (more than 300 days per year), and pleasant temperature (low 70s year-round), the climate is hard to beat. Arequipa is a great place for those who enjoy the outdoors. The city itself contains over five square miles of green space. Within two or three hours you can reach the Pacific Coast in one direction and the Andes Mountains in the other. This UNESCO World Heritage Site is packed with hundreds of historical houses and religious monuments, including the massive centuries-old Santa Catalina Convent that covers an entire city block. The nearby Yanahuara and Cayma neighborhoods offer a great city lifestyle at a relatively inexpensive cost. Trujillo: Trujillo is Peru’s third most populous city. The “City of Everlasting Spring” is home to the National Marinera Festival, a week-long celebration of the city’s world-famous traditional dance that happens annually during the month of January. As one of the first cities in the Americas founded by the Spanish conquistadors, it still harbors many colorful buildings from the Spanish colonial period. However, its Pre-Columbian roots are also evident with the nearby 2,000-year-old archaeological sites of Chan Chan, Temples of the Sun and Moon, and El Brujo. 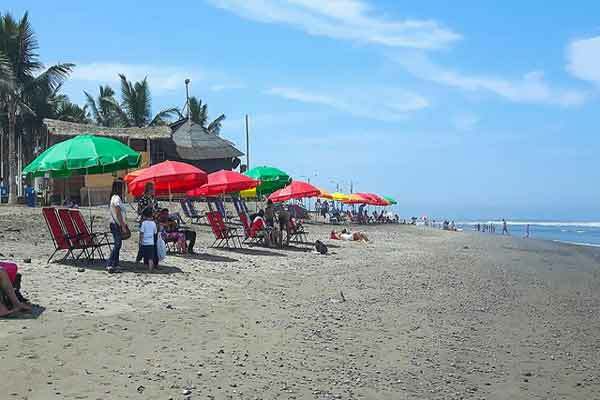 For relaxed small-town life, the beachside community of Huanchaco is only minutes away by bus. Here life goes on much as it has for decades. This popular beach town is known for its year-round surf, its caballitos de totora (traditional reed fishing boats), and its ceviche. Huanchaco offers the best of both worlds, a small-town beach community only minutes from a large city and all its amenities. Mancora: This seaside resort town is the gateway to Peru’s northern coast and its white sand beaches. Temperatures never fall below the high 70s in the winter and often reach 100 degrees in the summer. The warm water, year-round sunshine, and consistent surf and wind attract surfers and kite-surfers from around the world. Miles of white sandy beach stretch in either direction from the town center. Las Pocitas and Vichayito to the south and Punta Sal to the north are some of the best stretches of sand you will find.